The most common comments I get on Twitter and Instagram (catch that shameless plug?) are about my hair. 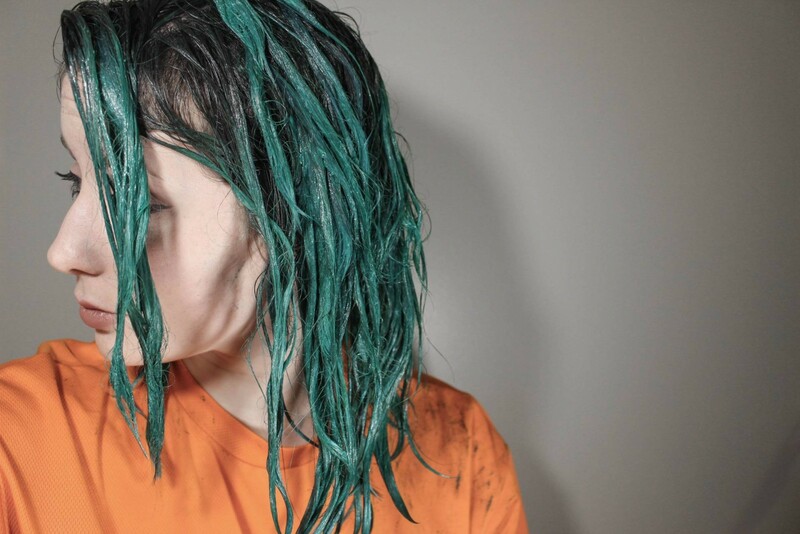 If nothing else, green hair is a conversation starter! I’ve had found that a nice balanced green is one of the hardest colors to achieve. 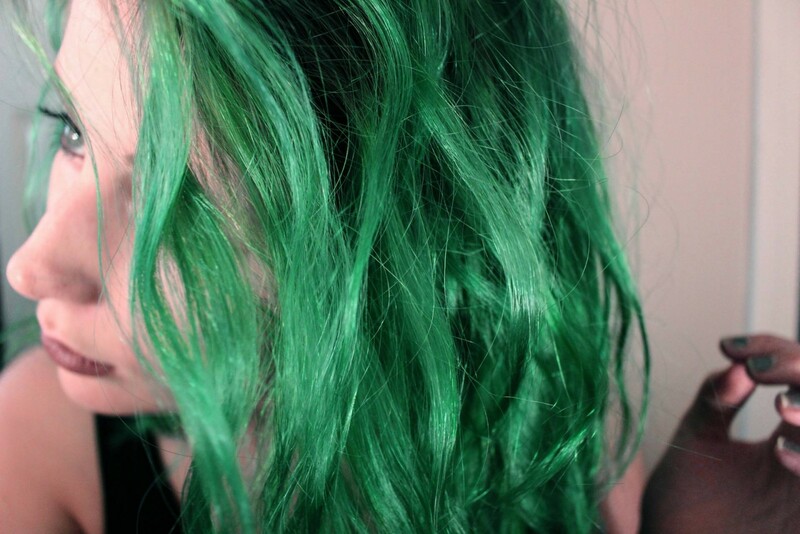 Most green hair tends to go teal or some sort of acidic yellow. I don’t have any problem with either, but when you want a nice emerald and people start commenting on your ‘blue’ hair, it can be a bummer. So, to avoid you having to go through the same struggle, I have worked out a pretty great dye combination it get a true green. First, you need supplies! All of the supplies in this post can be picked up at your local beauty supply. 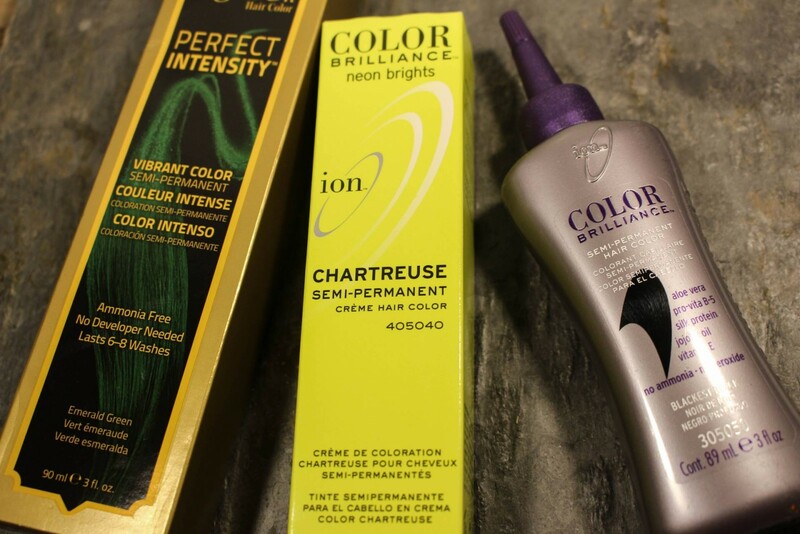 You will need One ‘n Only Argan Oil Hair Color Perfect Intensity dye in Emerald Green, as well as Ion Color Brilliance Semi-Permanent Neon Brights in Chartreuse. I like a good shadow root so I also use Ion Color Brilliance Semi-Permanent – in Blackest Black – but that isn’t a requirement – so it’s up to you. I also used two tint brushes, two bowls, and some gloves. If you have hair darker than a medium blonde you’ll have to bleach your hair first. I won’t be covering that in this post but if you want to know more about it leave me a comment below! 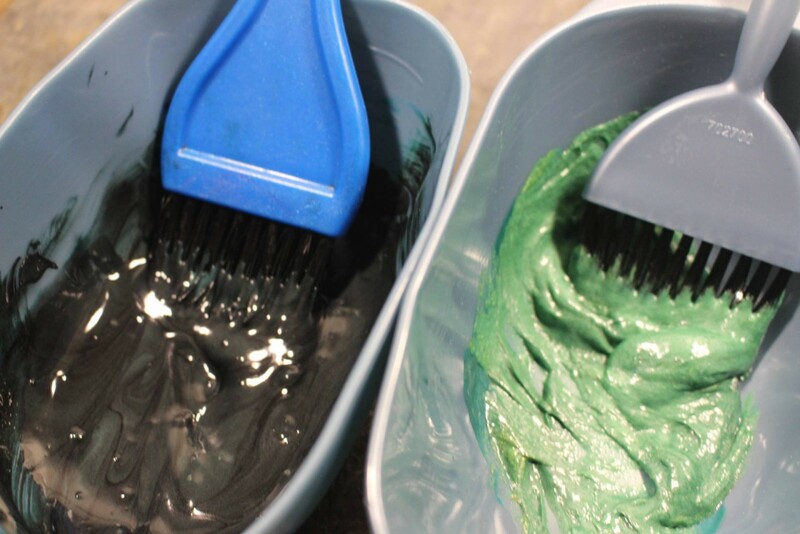 I mix the black and the emerald to make my root color and then I mix it with the chartreuse for my all over color. Mixing color is something I do by feeling but I would say about two parts emerald to one part chartreuse. I was starting with the faded green from my last dye so I didn’t have to worry about a third color. 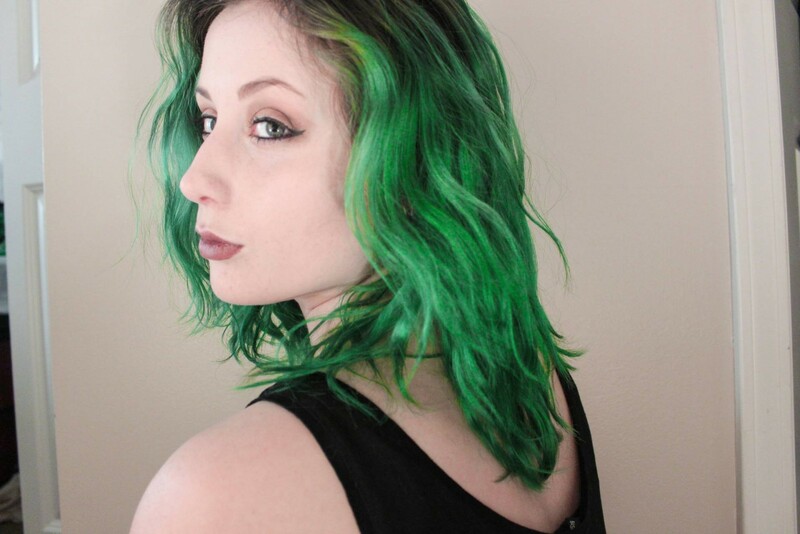 If you are coming from a bleach you might want a third color, I would suggest using the emerald with just a small touch of chartreuse, to add dimension. One of my pet peeves about colored hair is when it is flat – real hair has highlights and lowlights, colored hair is no different! I start by painting the darker color across my roots. I have been going bleach free for the past six months to give my hair a break so mine are relatively long but this is a stylistic choice. I would advise carrying the dark green mixture at least a centimeter onto your bleached hair to make sure the blend is nice. From personal experience if you don’t blend them properly you can end up with and unflattering yellow tinge. Then apply the brighter mixture to the rest of your hair! Then all you have to do is wait. I would say to wait at least 45 minutes but you can wait as long as you’d like. I usually try for an hour as these are semi-permanent dyes so if you wash them out too quickly you’ll end up with a weak, faded color. I have known people who wrap their head in plastic wrap and sleep with the dye but in my opinion, after about two hours your hair has reached critical mass and it doesn’t get stronger. Rinse it out and you are done! Green hair accomplished! Don’t panic if your tub turns a little green, a little bathroom cleanser and you will be right as rain. These photos were taken the next day as I like to avoid blow drying as much as possible, if you have just bleached it as well this is a particularly good tip. Another hair health tip is to not use shampoo when rinsing your color, but using a nice conditioner. After bleaching your hair is pretty stripped and does not really need the shampoo, but the conditioner will get you well on your way back to soft healthy hair. As far as color maintenance, try not to shampoo your hair to often, no more than every other day, to avoid fade. 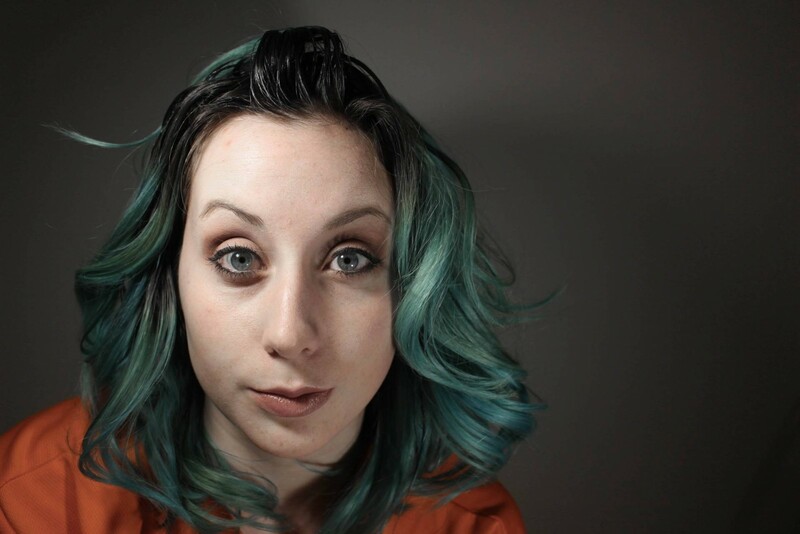 I hope this post was helpful for you, I know getting green hair isn’t easy and experimenting with colors only to achieve results you weren’t hoping for can be distressing. 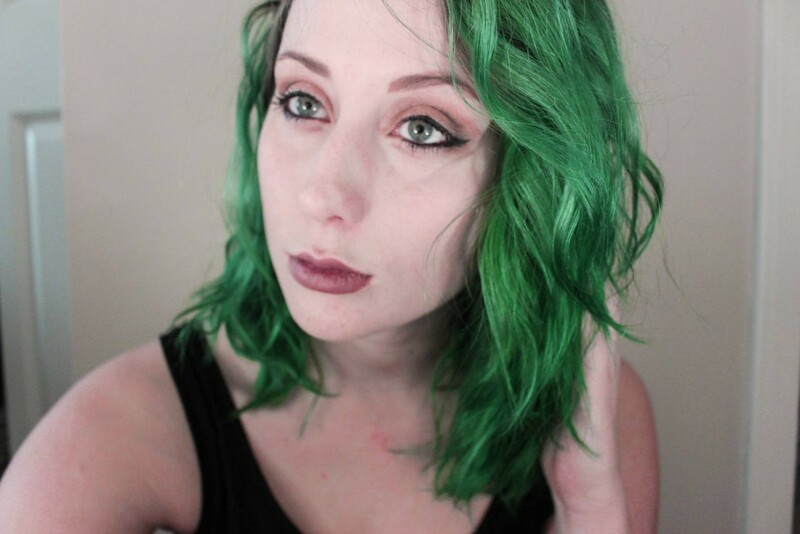 Please let me know if you have any green dye recommendations, or if you would ever rock the green in a comment below! I have never seen anyone accomplish Emerald Green. I have seen green in various shades, but this is particularly striking. Well done, and it does not hurt that it is near to the celebration of the Patron Saint of the Irish. Hello there, at the time I told my family that I was planning to go make cash online, they teased me. But afwarterd I showed them my income. Go and Google Rapid Cash Fortune toï»¿ discover the best way to make money online. Your hair is so bright! It truly reflects the gem you are. I love the tips you have for achieving multi-deminsional yet healthy and long-lasting color! Thank you so much! I really try to give realistic coverage of hair coloring. It can be done at home without really damaging your hair, you just need to be careful! I am thinking of doing a colored hair – care post in the next week or two so hopefully that provides a few more tips and tricks! I looooove your hair color. And yes, PLEASE do a tutorial about how you bleach your hair. I want to go from a dark brown to a light pink and I’d love all the tips I can get! Thank you lovely! I have been waffling about whether to do something fun and different soon so I think you’ll get something interesting soon! 😉 I am very excited for your pastel transformation! Your hair looks gorgeous especially in the first picture but I found this post a little hard to follow, especially as I didn’t think it was very clear precisely where and how you blended the colour with your roots, and your roots are cropped out of all the pictures..? I’m sorry you were having difficulty! In the fourth photo I have dyed only my roots so you can see the delineation. If you look at the fifth photo you can see the blend on my hair! I hope that helps but if you are looking for more photos you can check out Instagram.com/theachromat Thanks for reading! Honestly, the Argan Oil Emerald on hair that is at least a level 9 will get you there all on it’s own! It does fade a little blue but that was after a few months! The Ion does brighten it up and give a truer fade though! Let me know how it goes, best of luck! I've been meaning to buy a pair of Toms for awhile, and these new styles make it so much more tempting. Love the Eliana style and that Alndsaesra in burlap! Low budget sponsors that donâ€™t care about their brand-name will replace the sponsors that left. I doubt if the three so called new sponsors will be first rate brand names that are respected. Women are a powerful force and make most of the decisions in household purchases. I am a fulltime housewife. I am interested to have this kind of job as soon as possible. I want to help my husband financially. I am a dentist by profession but decided to be a plain housewife instead. I hope you will accept my application. Thanks and more power, God bless. Attractive color,I love it so much!